It is a very sad day for me...I have decided to close the Plum Tree Antiques at the end of the year. Including myself as an owner, The Plum Tree has been in business for nearly 16 years. I appreciate all the support from my great customers and have enjoyed my years as owner. This past year has been a real struggle as I know it has for a lot of you, and this has been a hard decision for me to make, however at this time it feels like the right one. I will still be selling antiques at The Scott Antique Market every month so if you get a chance, please come by and see me. I will also be selling at my friend Wendy's (Ms. Wendy's antiques) shop in Senoia and who knows, maybe one day I will be back. 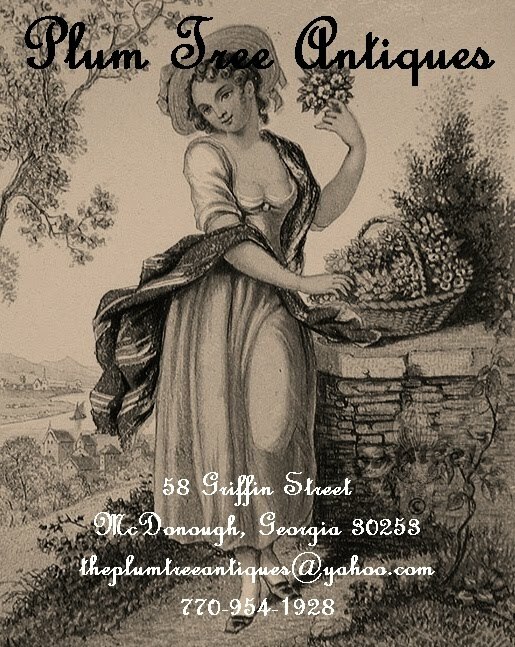 Please don't forget about Bob and Mark (Blumen Trio), trying to make a new start in their old location at 66 Griffin Street, they have a wonderful selection of merchandise and I am afraid they may get forgotten being that far from the square, I know they can count on the great folks of McDonough. We still have a great selection of gifts and Christmas decor available so please stop in to take a look. I will post any sales that are coming up on the blog. Never say goodbye so I'll see you around!